So sometimes you want a “Sunday dinner,” but you don’t want to do the classic run of fried or baked chicken, veggies and hot, homemade bread. So I decided to piece together something that spoke to my “raising” but was slightly different. 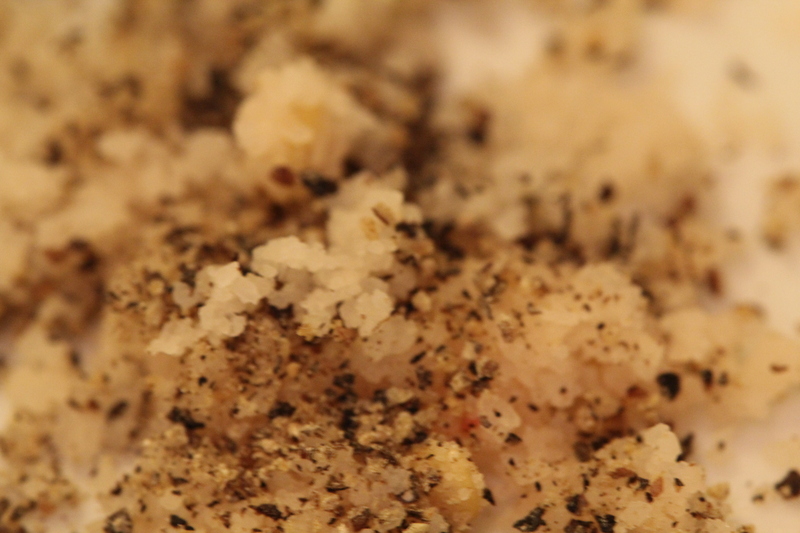 Grind the pepper together with the salt, crushing and mixing thoroughly. The salt should take on a pink color similar to Himalayan or Hawaiian salt. Store in a covered container and refrigerate. 1 small bunch fresh thyme, or a little rosemary, sage, lemon thyme, etc. 1 cup wine–I used a Champagne style sparkling wine because that’s all I had, however you can use a Riesling, Gewurztraminer, etc. A German white, off-dry wine would work best! 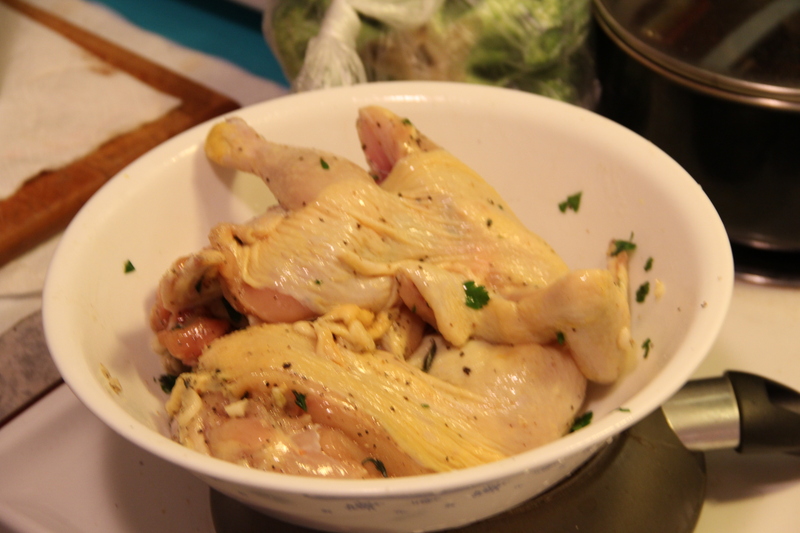 Place the chicken or Cornish hen in a large bowl. Season with fish pepper salt and pepper and drizzle with oil. Add the herbs and garlic and toss well. Cover with plastic wrap and let stand 30 minutes. Trim the green onions and half the chives after a thorough washing and drying with a towel. Slice thinly on a bias. Melt 2 tablespoons butter or margarine in a 10- or 12-inch skillet with a cover over medium heat. Add the onions and chives. Saute over medium heat until soft and transluscent. Season with a pinch of the fish pepper salt and pepper. Scrape mixture into a bowl. Return skillet to medium heat. 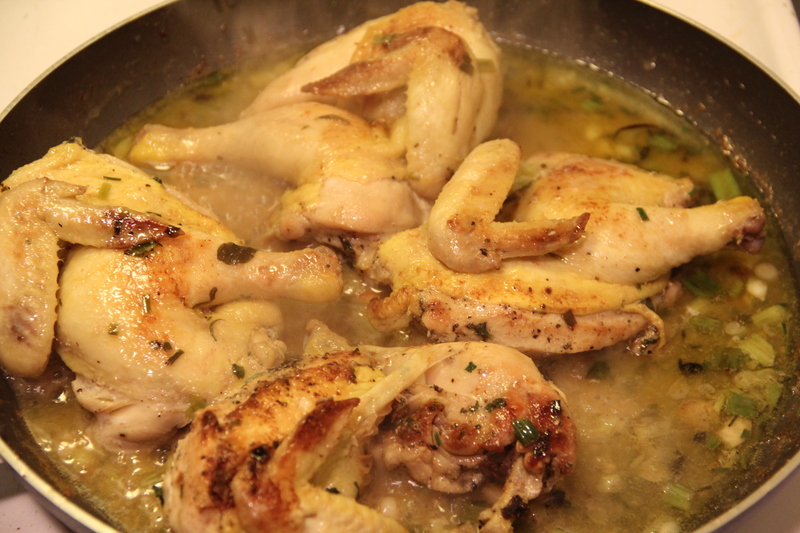 Add the Cornish hen pieces, herbs, and garlic to the pan. Cook, without moving the pieces, 10 minutes. 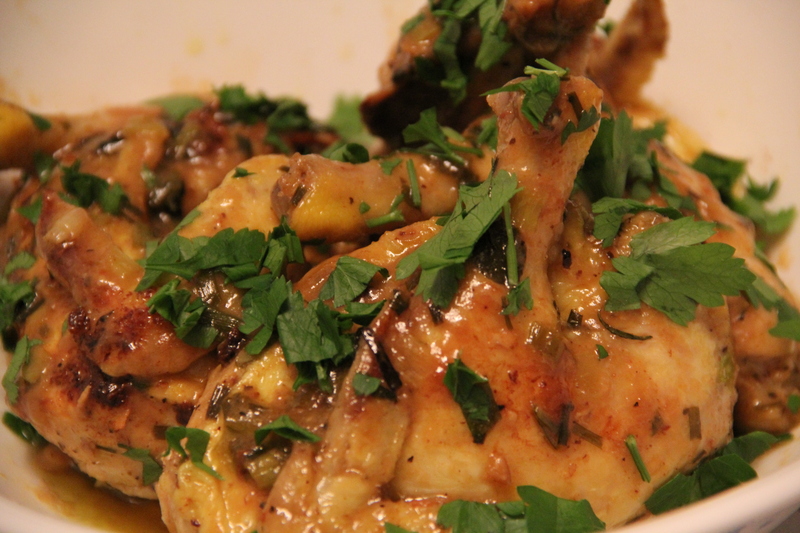 Flip the hen pieces, cover the pan, and cook 12 to 15 minutes more. Uncover pan and add the onion and chive mixture. 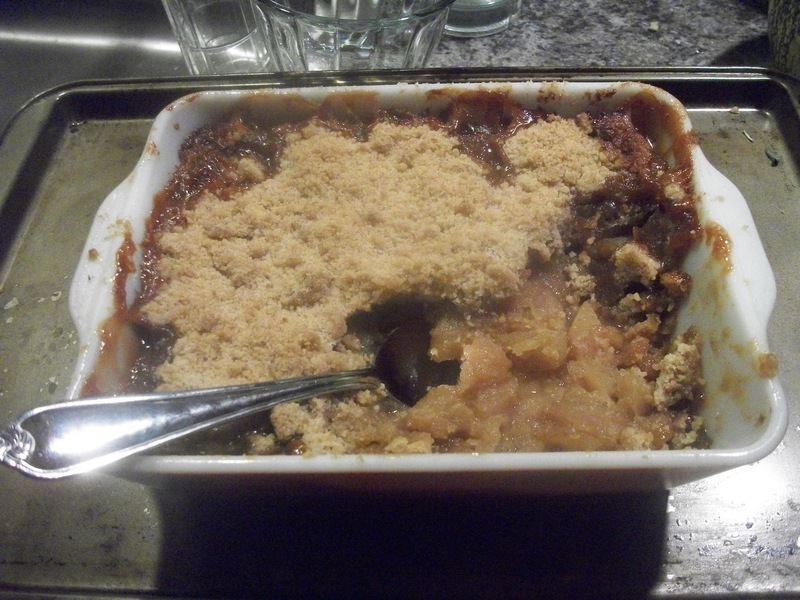 Pour in the wine and simmer, scraping up any browned bits from the bottom of the skillet, cooking about 10 minutes. Remove the pieces, let them rest for five minutes and keep cooking the sauce a few minutes more–or you can cut off the heat and stir to evaporate liquid. Do not let it burn and make sure you have some left! A little butter or margarine per Melissa’s instructions, helps at this point to create a silky, savory sauce. A note on ramps: Ramps are FAMOUS in the Upper South, especially Appalachia. There is really one true ramp, a hefty wild onion that packs a punch in taste and smell, and there are smaller varieties of ramp that can be collected in clean areas. I usually pick my own, but I used to see them for sale at the Union Square Greenmarket when I was there in 2010 doing a monthly chef gig. You are certainly welcome to see what happens if you follow Melissa Clark’s recipe to the letter. Be warned–ramps are not for the faint of heart. If you love the onion family—they are for you…. Preheat the oven to 425.I prefer to roast vegetables on the middle rack. Combine the vegetables in a bowl with seasonings and oil, toss gently a few times and place on a flat foiled cookie sheet or pan in a single layer. Place the pan in the preheated oven and roast for about 20 minutes undisturbed. 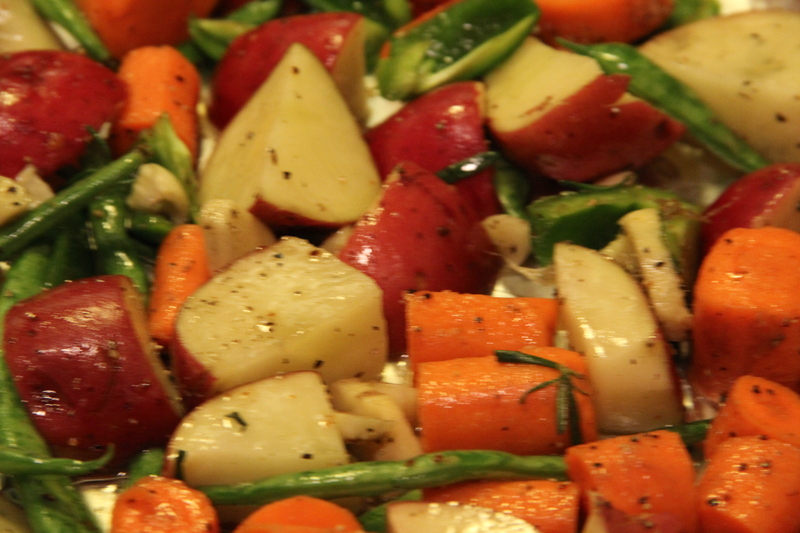 Give the vegetables a check to make sure they are browning evenly and are becoming tender. You may decide to turn some over and let the other side cook another 20 minutes. If you are in a rush, keep the temp high and check them often, if not, turn it down to 375 and let them mellow in the oven for about 30 minutes total, checking fairly often to avoid burning. A little water mixed with lemon juice–a few tablespoons max can take the temp down and give a little steaming action. You want tender, rich, nutty vegetables with caramelized edges and a mellow scent. 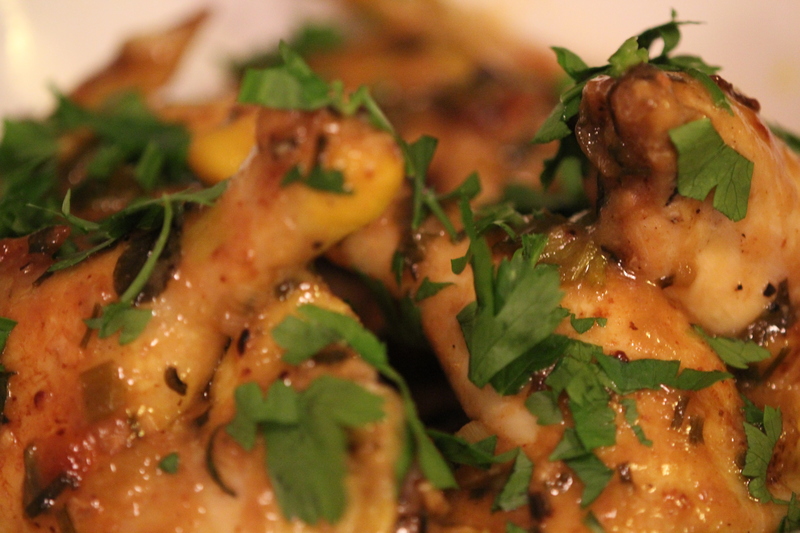 I always toss with chopped flat-leaf parsley and throw them in a serving bowl. They can rest but not for too long, they go to sleep fairly early but should be okay warm. Line a baking sheet with parchment paper; set aside. 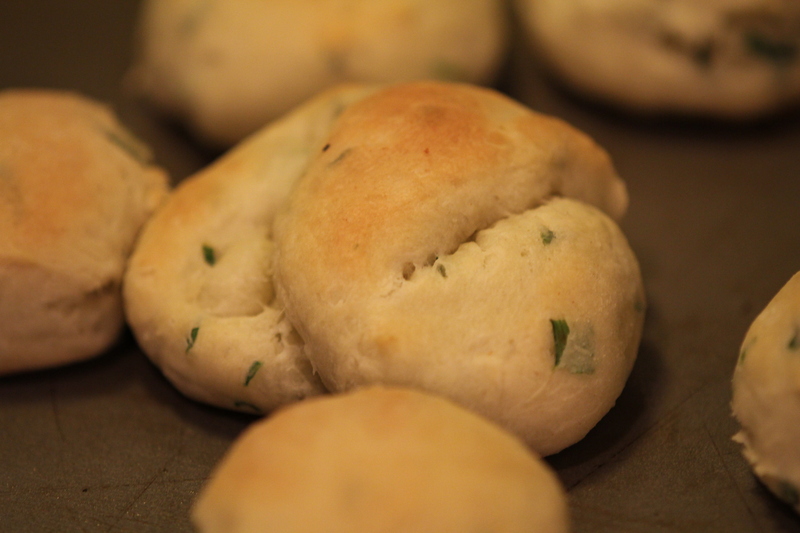 In a large bowl, whisk together the flour, baking powder, baking soda, salt, sugar, and chives. Using a pastry blender, cut in the butter and cream cheese until the mixture resembles coarse crumbs with a few larger clumps remaining. Pour in the buttermilk; using a fork, mix in buttermilk until incorporated and the dough just comes together. The dough will be slightly sticky; do not overmix. Turn dough out onto a lightly floured work surface. With floured fingers, gently knead about four times, until all the crumbs are incorporated and the dough is smooth. With a lightly floured rolling pin, gently roll the dough to a 8-b-11-inch rectangle, about 1 inch thick. Using a bench scraper or long offset spatula to lift the ends of the dough, fold the rectangle into thirds (like a business letter). Give the dough a quarter turn. Roll out the dough again (to the same dimensions), and repeat the folding process. Wrap in plastic, and refrigerate for 30 minutes. 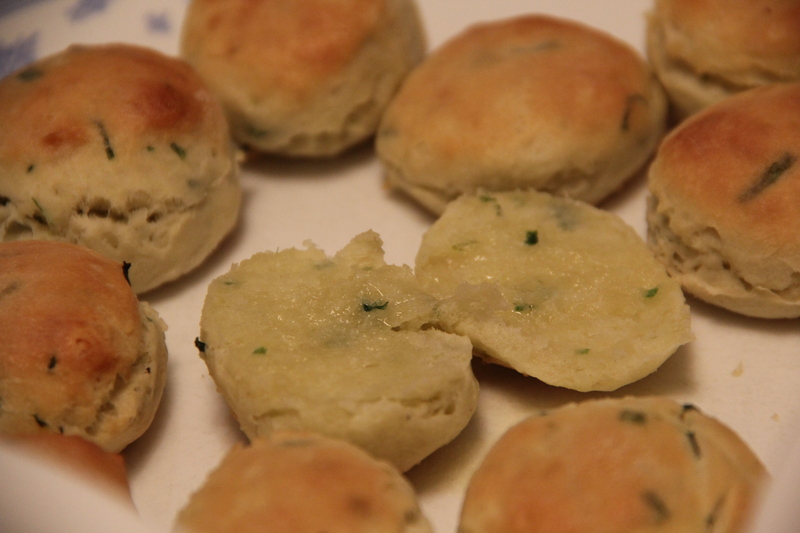 Preheat the oven to 424° F. Bake, rotating the sheet halfway through, until the biscuits are golden and flecked with brown spots, 15 to 18 minutes. Transfer the bicuits to a wire rack to cool. Ready for dessert? Hmmm, that’s the next posting! Fish pepper salt! Yes! 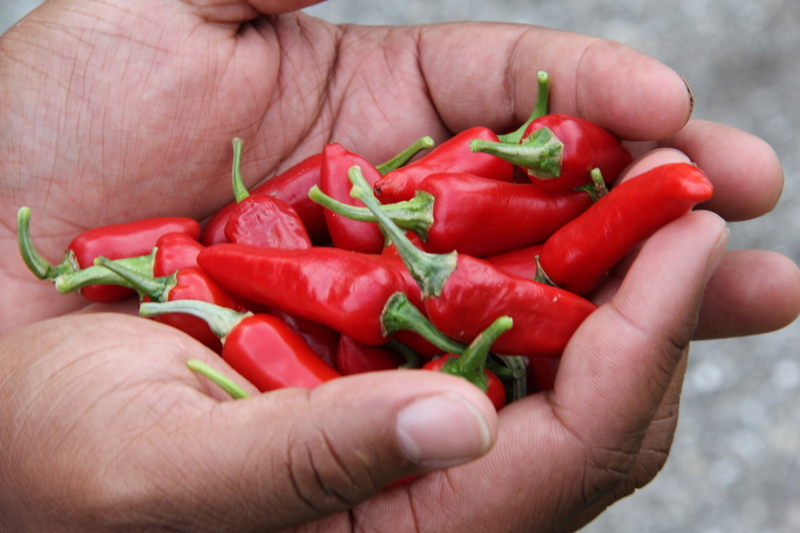 Thank you, this is what I’m doing with the rest of my fish peppers. 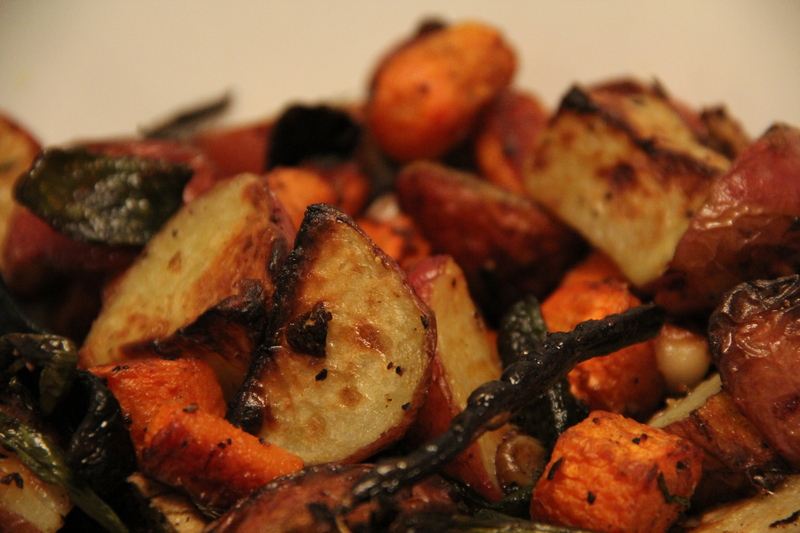 And roasted veggies, yum. I love this time of year.